Immunity-boosting vitamin C offers a variety of healthful benefits including the ability to fight off cold and flu, protects against certain cancers, may protect the heart, and helps with creating collagen (healthy skin). Eating a varied mix of fruits and vegetables can help to up the intake of this beneficial nutrient. 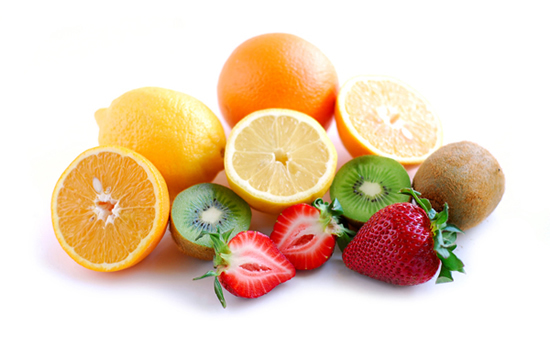 Our daily recommended intake for vitamin C is 90mg for men and 75mg for women. Bell peppers aren’t only delicious to eat, but also a great way to promote the health. A ½ cup serving of yellow bell peppers has about 155mg of vitamin C, which is well beyond the recommended daily intake. A serving of papaya (50% of the whole fruit) offers about 236mg of the healthful vitamin C. Plus, this fruit also benefits by giving a reliable source of fiber and vitamin A. A tropical fruit like guava is packed with vitamin C and holds about 364mg per one cup serving. This amount of vitamin C is nearly 5x the daily recommended intake. A 2 cup serving of kale is loaded with beneficial nutrients like 7 grams of fiber, 682 mg of potassium, and 150 mg of vitamin C. Kale is easy to consume by using as a base for a salad. Strawberries are able to boast a similar amount of vitamin C as an orange (medium-sized). A ½ cup serving of strawberries has about 93 mg of this nutrient and 52 calories. Broccoli is one vegetable that is loaded with healthful benefits. A single serving of this powerfood offers about 128 mg of vitamin C.
Kiwifruit gives an exotic taste and brilliant green color and is packed with vitamin C. A single serving of Kiwi has about 136mg of this nutrient. One of the cruciferous vegetables to eat often is the cauliflower. A 4-inch cauliflower head can provide a beneficial 126.2 mg of vitamin C and has about 62 calories. Serve up Brussels sprouts to enjoy a rich intake of vitamins and minerals. A 1 cup serving of nutrient-rich vegetable has 46.2 mg of vitamin C. Other health benefits include vitamin A, dietary fiber, magnesium, iron, and riboflavin. Chili power can offer a decent serving of vitamin C with a single tbsp containing about 5.2mg of this nutrient. Plus, it is a great source of minerals and antioxidants. Add more chili powder to your recipes to help enjoy the health benefits. Herbs (dried or fresh) are loaded with not just wonderful flavor but also nutrients. For a reliable source of vitamin C, fresh thyme can offer about 3.2% of the daily intake of this nutrient. This herb is easy to grow in the garden to ensure you are always within reach of a fresh supply. Mustard greens are a perfect base for a healthy salad. A single cup of mustard greens (chopped) can deliver 528.1 mg of vitamin C. This vegetable is also high in vitamin A and K, as well as folate and calcium.